Caving in Ontario – book, originally uploaded by Mic2006. 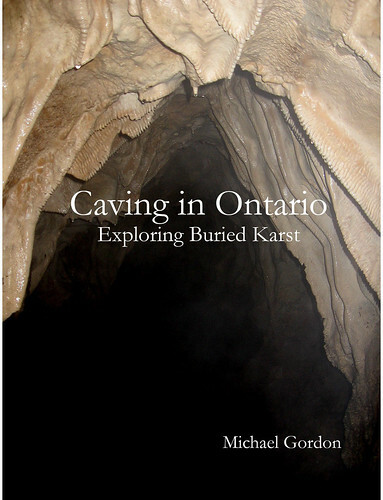 Release of the book, Caving in Ontario; Exploring Buried Karst is now imminent. I am expecting that it should be available for purchase through Lulu, or the Edgehill Press site within about 10 days – End of Dec. 2011. Caving in Ontario; Exploring Buried Karst is as much about Ontario’s caves as it is the experience of exploring them, the culture of cavers and the people that involve themselves in this activity. Caving in Ontario is large, colorful and full of fascinating sidebars – experiences of first time explorations in places where no human has ever gone, unusual anecdotes and snippets of geological, geographical and caving information. There are the better known caves such as Dewdneys Cave, Spanky’s Paradise, Moira Cave and others, then there are also the newly discovered caves- some of which still remain only partially explored. If you are into exploring caves, this book will tell you how to find them. If you are in any way interested in Ontario’s geography, geology or cutting edge exploration, or you’re just simply interested in caves and would like to see some interesting pictures, Caving in Ontario definitely is for you. I have been caving for over 25 years now, primarily in Ontario, where many believe that caves do not exist. Caving in Ontario will show you otherwise.